We had a very successful year and we continued to fulfil our aims and objectives to promote activities and schemes for the benefit of Exeter City FC and to also promote the inclusiveness of all disabled supporters and their personal assistants, this would not have been possible without the great help and support of our committee and our membership. We must be a very good omen for our football club because since we’ve been formed Exeter City has gained promotion twice since 2007. The committee was as follows: Nick Saunders (chairman); Colin Atkins (vice-chair & fundraiser); Jeanne Jones (secretary); Margaret Atkins (treasurer); Les Knight (press officer); David Jones; Steve Gazzard; Ian Jubb; Alastair Young and Dacre Holloway (ECFC Stadium Manager). Keeping City Fans in the loop. We were pleased to announce that at the beginning of the season we donated a Portable Induction Loop to the football club. This latest addition will enable supporters with a hearing impairment to us the impressive new reception, club shop and all the meeting rooms with enhanced confidence. The loop will be a big boost for supporters and visitors with hearing or cochlear implants. Providing personalised in ear sound, pure sound undistorted by background noise and customised by hearing aids to address individual deficiencies. In the Club’s plethora of meeting rooms it should minimise background noise and make being in a group of people a far more pleasant experience. The loop is a welcome supplement to the ‘Soccer Sight’ service introduced last year to provide a live stadium commentary on match days. At the clubs home match on Saturday 4th April, ECDSA showed their support to The National Association of Disabled Supporters (NADS) campaign by sponsoring a child with Learning Difficulties to be a match day mascot. The club showed their support by with a good article in the match day programme with the article outlining what NADS ‘Level Player Field’ campaign was all about. 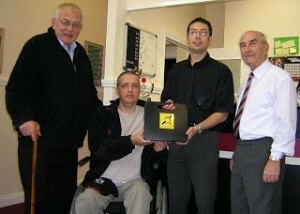 More details on NADS campaign, visit their website. NADS has now been renamed, Level Playing Field (LPF). We were able to sponsor the Exeter City Ability Counts team by getting them new football shirts. We have also sponsored our President Bertie Cozic Sock Ties & Training Kit. We all at ECDSA were saddened by the sudden passing of our dear friend in December 2008. He supported us greatly on what we are trying to do and without his help and support our jobs would have been a lot, lot harder. As a founder committee member he will be missed greatly by all of us at ECDSA. 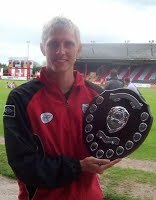 Most Improved Player award 2008/09. 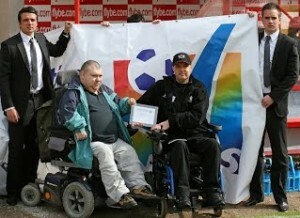 Nick Saunders, Exeter City’s Disabled Supporters Association Chairman, has been voted the National Association of Disabled Supporters (NADS) Volunteer of the Year as part of their ‘level playing field’ award. Nick, who is also the Disability Liaison Officer for Exeter City was presented with his award by Gary Deards from NADS at our home match against Morecombe on Saturday 25th April. Since joining the Exeter City Supporters Club committee in 2002 Nick has strived to give disabled supporters a greater say in what happens at their football club. 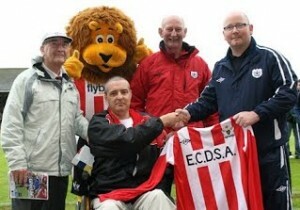 He set up the Exeter City Disabled Supporters Association in 2007, the association have 35 members to date. The National Association of Disabled Supporters was established in 1998 and is a national registered charity representing disabled supporters of all sports together with their carers and advocates. Nicholas was nominated by the Exeter City Supporters Club Chairman and is clearly a real hero at Exeter City working tirelessly to improve the provisions for disabled supporters. His commitment to Exeter City and the disabled supporters is to be commended and we are delighted to celebrate his achievements as a volunteer at the club.